SOLD Sol Chariot and Roma Denarius Pendant; Please Explore Our Roman Pendants For Similar Items. 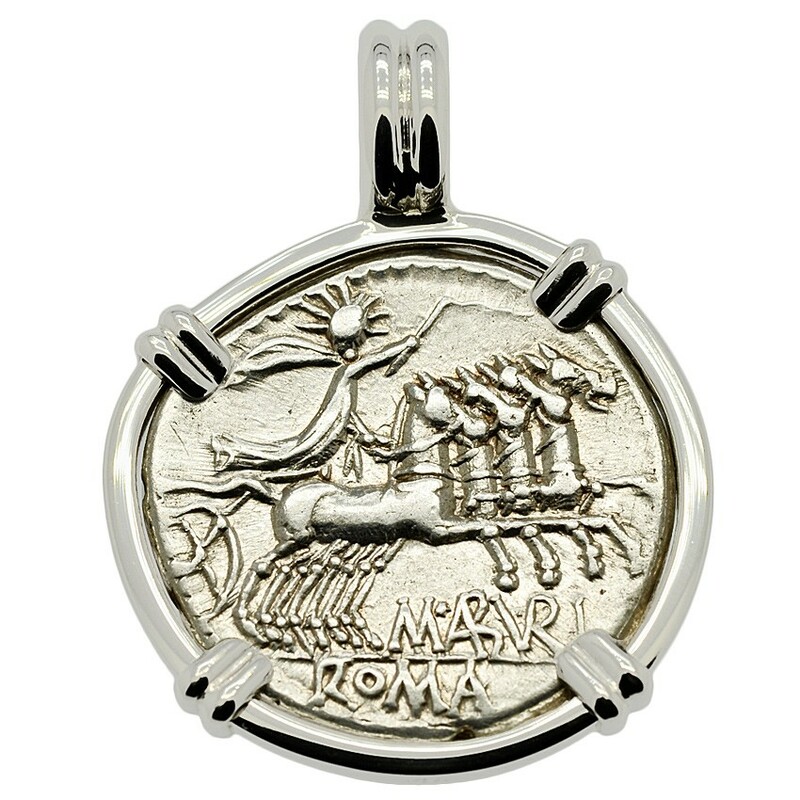 This denarius coin was minted in Rome by moneyer M. Aburius M.f. Geminus in 132 BC. 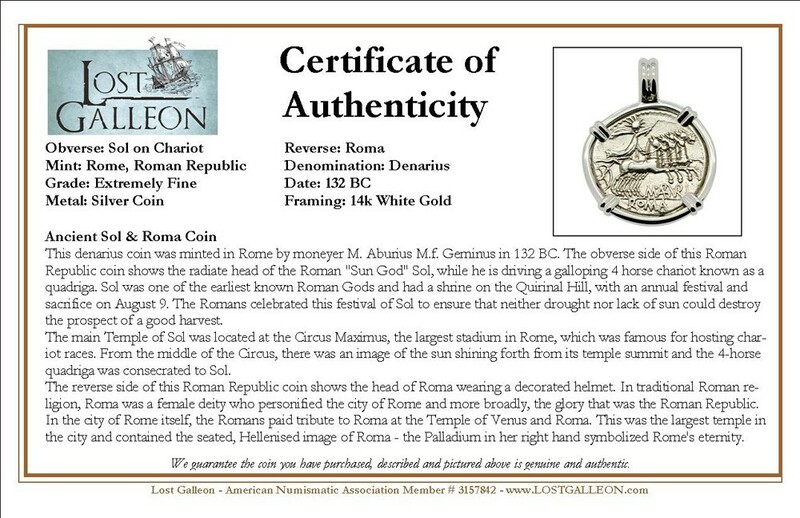 The obverse side of this Roman Republic coin shows the radiate head of the Roman "Sun God" Sol, while he is driving a galloping 4 horse chariot known as a quadriga. Sol was one of the earliest known Roman Gods and had a shrine on the Quirinal Hill, with an annual festival and sacrifice on August 9. The Romans celebrated this festival of Sol to ensure that neither drought nor lack of sun could destroy the prospect of a good harvest. The main Temple of Sol was located at the Circus Maximus, the largest stadium in Rome, which was famous for hosting chariot races. From the middle of the Circus, there was an image of the sun shining forth from its temple summit and the 4-horse quadriga was consecrated to Sol. 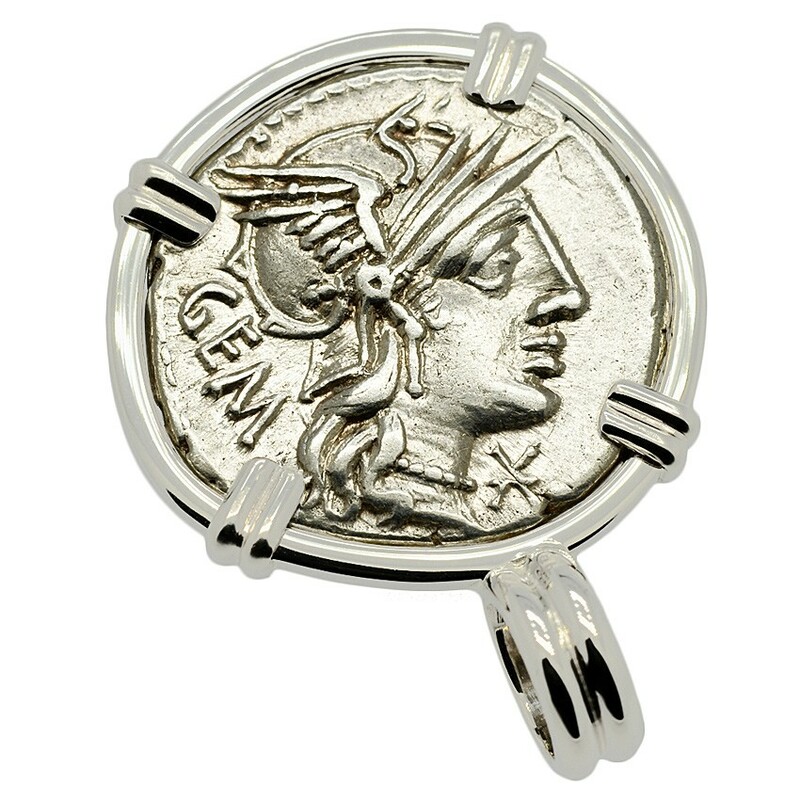 The reverse side of this Roman Republic coin shows the head of Roma wearing a decorated helmet. In traditional Roman religion, Roma was a female deity who personified the city of Rome and more broadly, the glory that was the Roman Republic. In the city of Rome itself, the Romans paid tribute to Roma at the Temple of Venus and Roma. This was the largest temple in the city and contained the seated, Hellenised image of Roma - the Palladium in her right hand symbolized Rome's eternity.